A self-described “Pacific Northwest girl,” Deputy Chief Carmen Best grew up in Tacoma and served in the Army before joining the Seattle Police Department in 1992. She’s risen through the ranks and has worked closely with Chief Kathleen O’Toole, whom she hopes to replace as Seattle police chief. 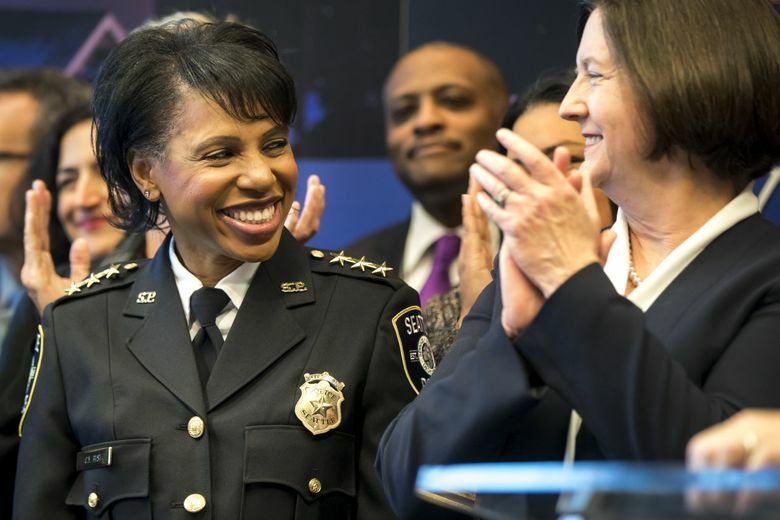 During Chief Kathleen O’Toole’s 3 ½ -year tenure leading the Seattle Police Department through court-mandated reforms, a command-staff shake-up and implementation of new technology, Deputy Chief Carmen Best has been by her side, soaking up lessons in leadership. Best, 52, considers O’Toole both a mentor and friend. She also sees herself fulfilling one of O’Toole’s early goals — making sure people from inside the department have the ability to rise through the ranks to the level of chief. “I do feel like the protégé who is ready” to lead, said Best, who will become interim police chief Jan. 1 and plans to be a contender for the permanent job. She could face stiff competition. Mayor Jenny Durkan said she plans a nationwide search for a new chief, which she hopes to complete by spring. Best — who attributes her success to hard work, resiliency, organization and trustworthiness — sees reforms made during O’Toole’s tenure as part of the department’s ongoing evolution. “Reform doesn’t end … It’s an iterative process, it’s continuous,” with leadership always striving to implement best practices and identify and fill in gaps in training, policy, accountability and technology, she said. Raised in Tacoma, Best graduated from Lincoln High School in 1983 and went on to study at Eastern Washington University, where she ran track. Midway through college, she joined the U.S. Army in 1986, intending to go back to school after she finished basic training. But Best said she enjoyed the Army so much, she stayed on — serving a year in South Korea before returning to Fort Lewis — now Joint Base Lewis-McChord — where she worked as a supply clerk, then in an administrative role for the 9th Infantry Division. She left the military in 1989 and worked a couple years as an accounts processor at Aetna insurance. It was during that time she met her future husband, Larry, who has been an inspector at Boeing for the past 30 years. They’ve been married 23 years and have two grown daughters, Whitney and Kaylee. While still working at Aetna, Best decided to test with the Seattle Police Department. “I wasn’t even sure if it was going to be a lifelong career. I just wanted to try it out,” she said. As with the Army, Best found she enjoyed the experience of going through the police academy and field training. “It’s in the DNA of Carmen — I like working on teams, I like working with people,” she said of her nearly 26-year career with SPD. According to her department bio, Best’s assignments have included stints in patrol, school safety and media relations; she’s served as a patrol supervisor, watch commander and operations lieutenant. She’s also had command positions in the narcotics unit, the robbery, gangs and fugitives unit, and in community outreach. Best, who has completed a number of police-leadership training courses, earned a bachelor’s degree from Western Illinois University in 2014 and is set to finish her Master’s in criminal-justice leadership from Northeastern University this spring. “Everything is about relationships. It’s important we treat people right, we engage with the communities we serve and build relationships with them. It doesn’t even feel like work,” said Best, who has become one of the department’s most-recognized faces. “Just the other day, we did “Coffee with a Cop” in Columbia City and Alki. We’re in uniform, answering questions, talking to the community. I felt like I was making a difference. It was like, I’d almost do this for free,” she said. Best, who was a finalist for chief of the Dallas Police Department this past summer, said if she is to become Seattle’s next police chief, she and her husband would move from Snohomish County into the city so that she would be more accessible. Seattle Times staff reporter Steve Miletich contributed to this story.